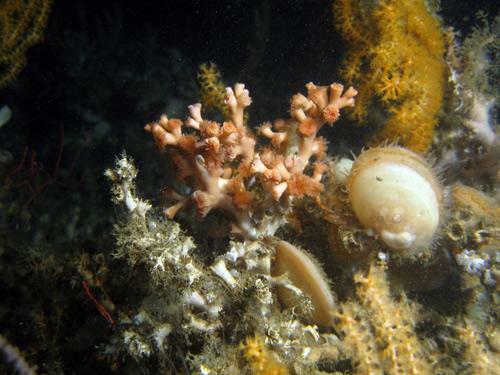 A young Lophelia colony with outstretched polyps. Credit: Tomas Lundälv, Sven Lovén Centre, University of Gothenburg. A rare cold water coral reef has been discovered off the coast of Mauritania in Northern Africa, the first time such a reef has been found this far south, according to a new report. In the middle of an enormous rock formation in an undersea canyon, scientists have found a thriving coral ecosystem in deep cold water. This coral wall on the continental shelf off the coast of Mauritania measures about 164 to 197 feet (50 to 60 meters) high and is 118 miles (190 kilometers) long. 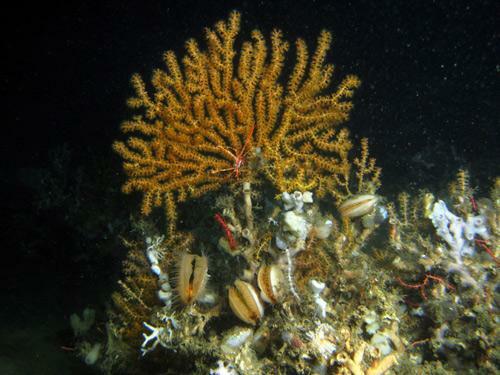 Cold water coral ecosystems were known to form much further north, around Scandinavia and in the Irish Sea, but this is the furthest south they have been found. Researchers lowered a robot to the seafloor, 2,000 feet (615 m) underwater. There they discovered a flourishing coral ecosystem. The researchers spotted spectacular animals including a heavily calcified Lophelia coral with orange-red polyps, and gorgonias coral, a common reef building coral in the tropics. Giant clams were hanging on the coral, similar to Norwegian reefs, according to the expedition report. Unlike tropical corals, cold water corals live at 55 degrees Fahrenheit (13 degrees Celsius) in the dark and nutrient-rich deep sea region below 650 feet (200 m). The study team knew of a loose cold water coral reef which extends to southern regions, said André Freiwald, a team member from University of Gothenburg in Sweden. Until now, however, scientists had only found fossil coral reef structures on the seafloor off the coast of Gibraltar and Morocco. An octocoral colony with giant clams grows on a dead Lophelia coral colony. Credit: Tomas Lundälv, Sven Lovén Centre, University of Gothenburg. Near Mauritania the scientists found the powerful carrier crab Paromola and the giant deep sea oyster Neopycnodonte, also never before observed so far south. These giant oysters form thick populations and can be described as Methuselahs among animals, with some individuals living for over 500 years. The surprising discovery of cold water coral ecosystems may be due to offshore winds pushing the surface waters from the Mauritanian cliffs out into the open ocean. This would create a flow of cold and nutrient-rich water to the coral ecosystems, Freiwald said. The Maria S. Merian will stop at and chart further parts of the coral system in the canyon of the continental shelf off the coast of Mauritania. The current research voyage ends Nov. 20. Freiwald expects the next dives on this expedition to provide information as to whether the newly discovered ecosystem represents a single structure or whether a spatially extended living reef province exists in the southern waters. Posted on February 25, 2011, in Uncategorized. Bookmark the permalink. Leave a comment.